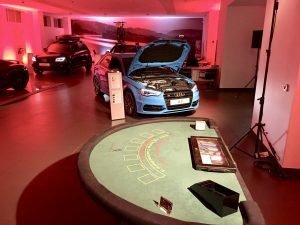 Based in Essex and working on events across the UK, we provide the best fun casino for all types of corporate events and office parties, team building, product launches, and PR campaigns. 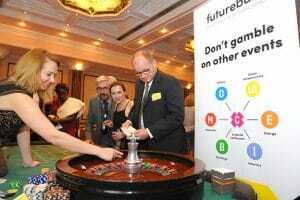 Our knowledge, creativity and friendly approach make us the most sought-after fun casino hire company in the UK. Whether you’re planning a small or large event, we’re sure that we can accommodate your requirements. A fun casino has proved to be a very successful and popular form of corporate entertainment. It’s not just about winning or losing; our professionally trained croupiers are also there to interact and ensure that you and your guests have a great time. We can provide many different packages to meet and exceed your needs. Our corporate fun casino service is versatile and can be used in many different ways from entertaining important clientele to corporate identity. Branded casino chips, fun money, and playing cards are always a good starting to point to reinforce your corporate identity. At Ace of Diamonds, you can mix business with pleasure. The casino builds an atmosphere instantly – it’s a fantastic ice breaker, encouraging guests to converse, mingle and get to know each other. This will add an exclusive touch to any corporate event.